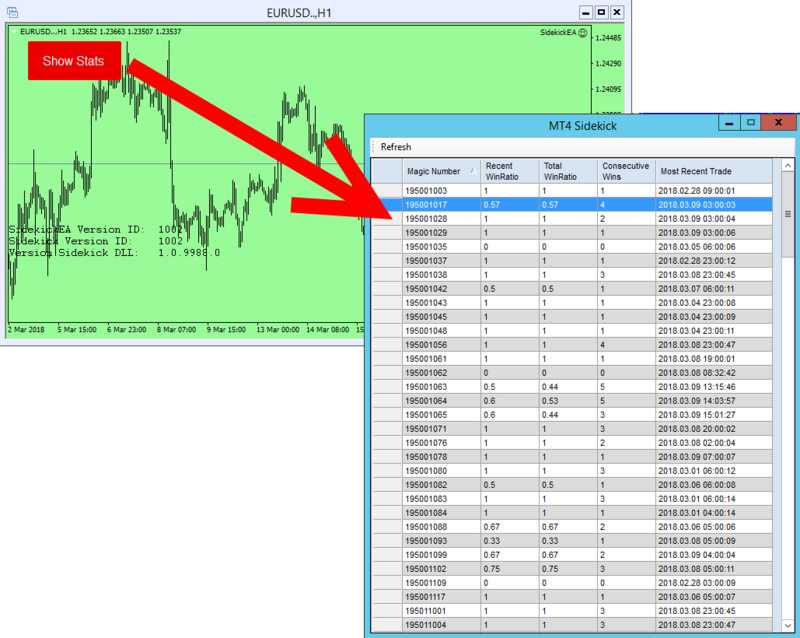 MT4 Sidekick is a new and innovative tool that uses a Demo Account to create a database of trade results that is shared with a Live Account. When a strategy (EA) in a Live Account receives a trade signal it checks the database to determine how that strategy is currently performing in the Demo Account. If the strategy is currently performing well in the Demo Account then a new position is opened in the Live Account — otherwise, the signal is ignored. The idea is very simple, two accounts — Demo and Live — running the same portfolios and strategies. The strategies in the Demo Account are allowed to trade with no restrictions and are used to create and update an active, shared database of trading results. When a strategy in the Live Account receives a signal it checks the database before opening a new position. In this way the Live Account can use the Demo Account as a barometer to determine how a strategy is performing in the current market. The availability of a barometer that measures current performance and which can be accessed before a position is opened is a powerful technique. A strategy’s performance will vary depending on patterns that occur in the current, incoming data — and the incoming data is always changing. So, taking advantage of a Demo Account in this way — i.e. as a “barometer” — opens up a new way of managing EAs and trades that can be used to your advantage to provide a real “edge”. High-quality strategies generated / trained by FSB-Pro. Using MT4 Sidekick is not a substitute for creating good strategies — that should still be the #1 priority. High-quality strategies are ones with excellent back testing statistics and Win / Loss percent in the high 80% (or higher). Confidence in your broker’s Demo Account. That is, you’ve determined your strategies and portfolio EAs perform similarly in Demo and Live accounts. Our Portfolio Maker tool is used to combine individual FSB-Pro strategies into a portfolio EA. 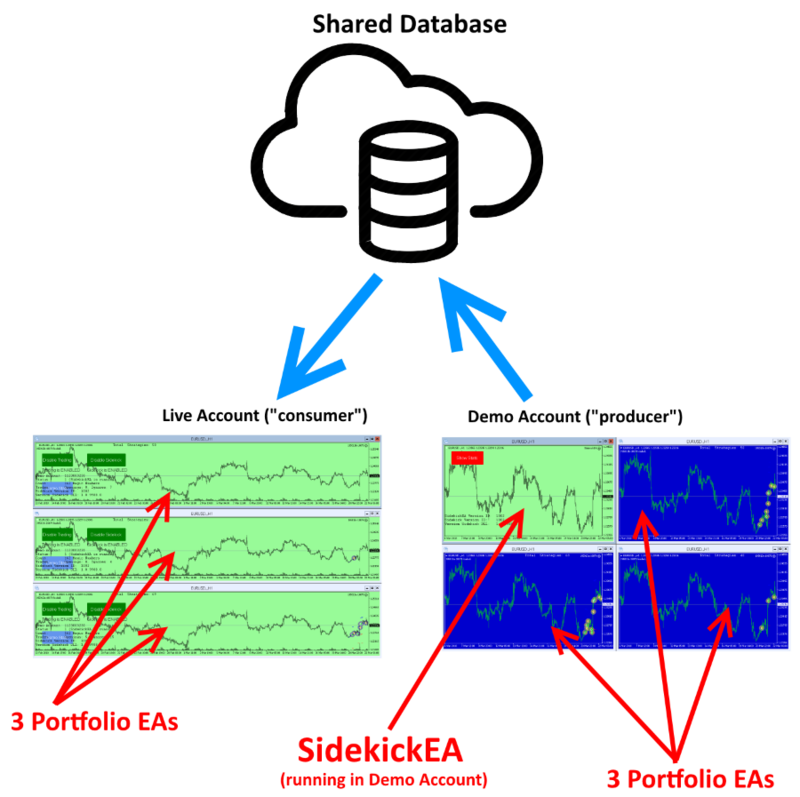 Portfolio Maker is required because it inserts code into the portfolio EA that knows how to access MT4 Sidekick’s shared database. 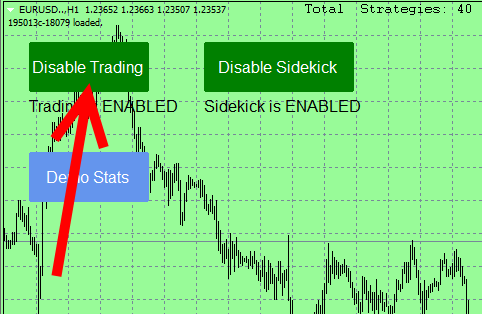 MT4 Sidekick is an EA (Expert Advisor) that runs in your Demo Account. It keeps track of all trades and maintains a database of all trades — strategy-by-strategy (i.e. by Magic Number). The same portfolio EA(s) that you created using FSB-Pro and Portfolio Maker run in both this Demo Account and your Live Account. When a strategy in the Live Account receives a signal, it checks the shared database to determine how the strategy is currently performing under current market conditions. If the check passes then a new position is opened in the Live Account — otherwise the signal is ignored. 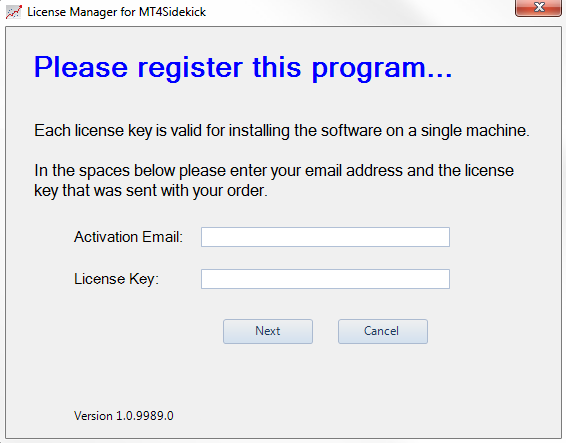 After installing the application, the first time you launch the program it will prompt for the license key — which was sent by email. After the license key is entered it will be stored on your machine so subsequent launches will not require that you again input the license key. MT4 Sidekick is easy to install — it consists of two files: SidekickEA.ex4 and Sidekick.dll. 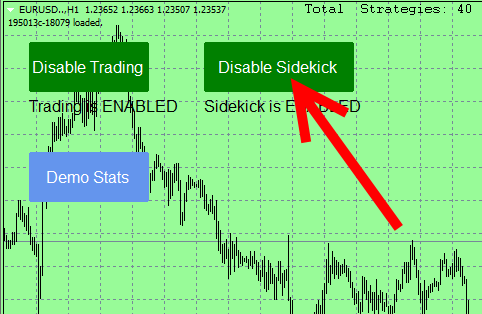 Both are copied to your Demo Account’s MetaTrader 4 installation folder — SidekickEA.ex4 to the …\MQL4\Expert folder and Sidekick.dll to the …\MQL4\Libraries folder. There is one important requirement — you really must close all running instances of MetaTrader’s Terminal.exe. This is because MetaTrader loads DLLs into memory and never releases them, making it impossible to update a DLL when Terminal.exe is running. If this is the first time you are installing MT4 Sidekick then it may not be necessary to close Terminal.exe — but you should be aware of this requirement as future updates become available. The SidekickEA.ex4 Expert Advisor only needs to be installed to Demo Accounts, whereas the Sidekick.dll is installed to both Demo and Live Accounts. To facilitate installing these files, the MT4 Installer application can be used. 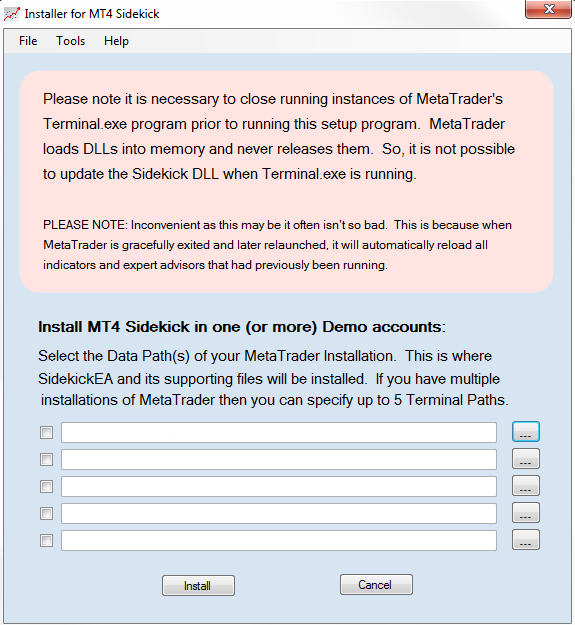 The installer can copy the SidekickEA.ex4 and Sidekick.dll files to your MetaTrader installation folders — up to 5 Demo or Live accounts. After selecting the Data Path(s) of your MetaTrader installation folders, check the CheckBox on the left and press the ‘Install’ button. Again, be aware that in order to update a DLL the corresponding Terminal.exe program must NOT be running. Just to be clear — Sidekick.dll is required by both your Demo and Live Accounts, whereas SidekickEA.ex4 is only run within the Demo Account. It is okay if SidekickEA.ex4 is copied to a Live Account — simply ignore it. SidekickEA.ex4 is an Expert Advisor — attach it to a chart window and it will begin running. You can choose any symbol or time frame — it doesn’t matter — also, there are no input parameters to set. When you attach SidekickEA.ex4 to a chart it will create a database of all trade results for the Demo account — depending on the number of trades this could take a few seconds or a couple of minutes. The SidekickEA.ex4 is harmless — it does not trade. It simply creates a database when first attached to a chart, and then updates that database as trades are completed. The image above shows SidekickEA.ex4 running in a Demo account. When you press the “Show Stats” button a grid should appear that summarizes all trade results. This is one way to confirm that the shared database has been created. The final step is to attach your portfolio EA to both the Demo and Live Accounts — i.e. the same portfolio EA is attached to both accounts. The portfolio EA is created by Portfolio Maker, which combines individual strategies generated / optimized by Forex Strategy Builder Professional. Portfolio Maker is required because it inserts the code that knows how to access the shared database created by the Sidekick expert advisor (SidekickEA.ex4). The image below shows the input settings for the portfolio EA when attached to a Demo account. Please use the default settings. This is because you want the portfolio EA to trade without any restrictions in the Demo account. 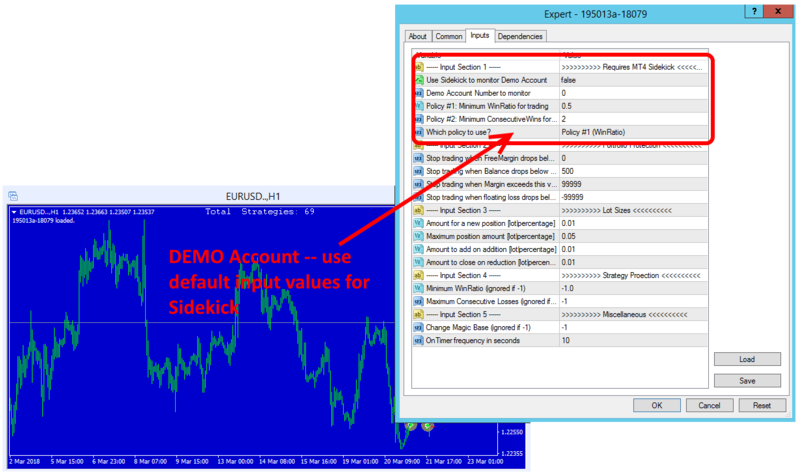 The first input setting “Use Sidekick to monitor Demo Account” should be false. The image below shows the input settings for the portfolio EA when attached to a Live account. In this case the input settings are important since the code needs to know which shared database to access. Though you are free to experiment, we recommend using Consecutive Wins. In the FAQ page we briefly describe why that is our preference, along with additional comments about MT4 Sidekick and Portfolio Maker. Pressing the ‘Demo Stats’ button will list the current trading status of those strategies that belong to the current portfolio EA. For example, in the image below, the portfolio EA contains 40 strategies. When the ‘Demo Stats’ button is pressed then the ‘Experts’ tab lists the status of the 16 strategies that have traded so far. 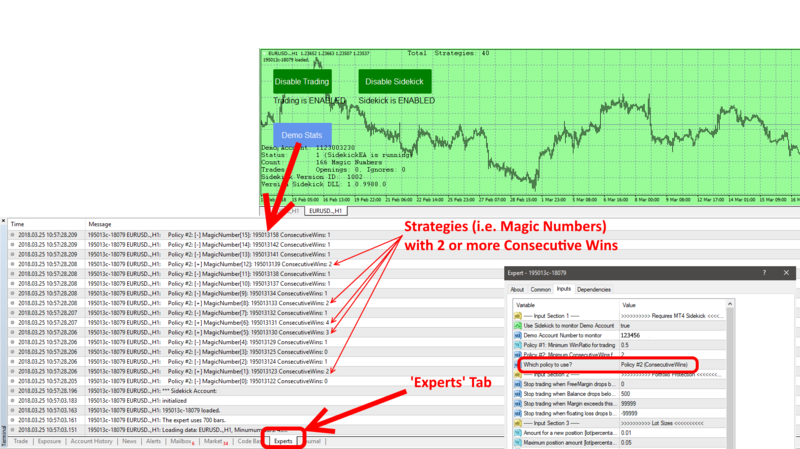 And, among those 16 strategies, 5 have 2 or more consecutive wins. If we had instead been using Policy #1 (Win Ratio), then win ratios would have been reported. Pressing the ‘Disable Trading’ button prevents new positions from being opened. Positions that are currently open will remain open and only close when the appropriate signal is detected. Pressing the ‘Disable Sidekick’ button means the portfolio EA will no longer refer to the shared database when deciding whether or not to open a new position. The shared database created by the Demo Account is implemented as a folder with files. The name of the folder is the Demo Account’s number, and the names of the individual files are the magic numbers of each strategy. 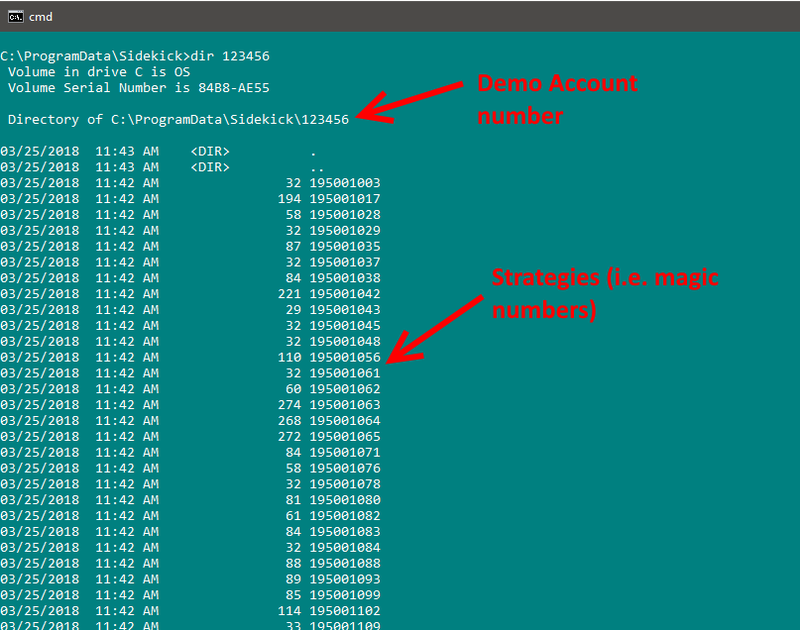 For example, the image below shows the database for Demo Account number ‘123456’, along with the magic numbers of those strategies that have traded so far. Strategies that have not yet traded will not appear in the database. The individual files are text files that contain trade results for each strategy. For example, the image below shows the trade results for strategy ‘195001064’. SidekickEA is not running and a database does not exist. This would occur if SidekickEA has never been run previously. SidekickEA is currently running and a database exists — suggesting the software is working as expected.